Ugh there is something about snow in March that can't be anything but annoying. It's a test of will and patience and endurance is what it is. But a no-school snow day was a nice little reward at the same time. Jeff surprised the two boys who could go with a DC trip to the Big Ten tournament. And what a tournament it was! I am so so happy for my uncle. I really feel he deserves this just on the basis of what a good person he is, and what a leader he is to those college guys and how darn humble he is and how hard he works too. I'm so happy also, for Andrew and Patrick who will never forget witnessing in person this win. They all stayed with Joe my brother and Karen his wife who were perfect hosts. Jeff took Abbey on a ski trip. This is his mocking selfie pose, just as attractive as it is on everyone. Janey and I found this little purse at a resale shop, almost brand new and she know has another bag to add to her bag lady collection. She is such a sweetheart, such a good easy little girl. I love my days with her. I've been doing some really really heavy reading lately. They were difficult reads-not because of the style of writing-I read them within days, but because of the content. Etched in Sand is about a women who survived a terrible childhood and escaped to leave a successful life-bearing scars of course. 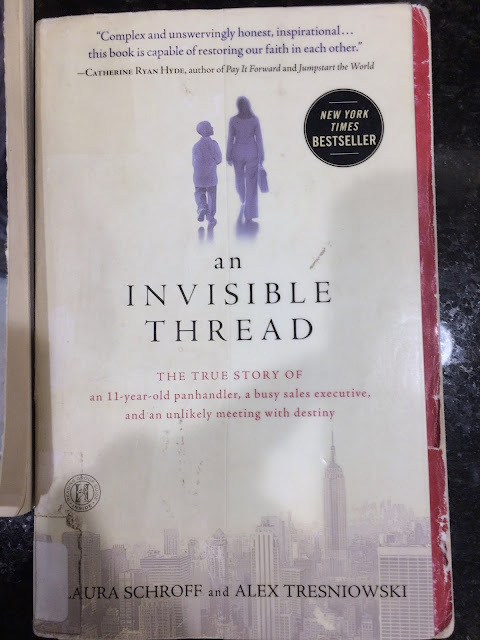 An invisible thread is about a woman with a successful career in NYC, who one day walked by a boy panhandling, but turned around to connect with him, an action that would change both their lives immensely. Another story of child abuse and neglect and a light on the other side. It was interesting to read the last three books together-Hillbilly Elegy and these two. They are all similar in the sense that they describe difficult childhood situations and a way out. Children's Services-always feared, even within circumstances of starvation and physical abuse (the one case of sexual abuse was actually a foster situation), drug abuse at the core of all three stories, either just one little action (varying widely in terms of personal investment in all three stories) of a person 'outside' who cared enough making a huge difference in these kid's lives. It all works up to some sort of luck/fate/education intertwined with a strong spirit at the helm-who survives and who doesn't. It is all heartbreaking and terribly frustrating and shouldn't ever happen. Drug addiction does terrible terrible things to families for generations and generations. It is truly the devil's magic elixir it seems-it destroys a person and then shreds their children apart. I really think it's important, as hard as it is, to read and listen to first-person accounts of human experience. I have been thinking lately (and I'm sure I am guilty of it also) of how today so often one can easily spout off about solutions and causes to social problem but what do we really know if it until we really hear the human experiences. That's listening more than talking. That's real life experience more than statistics and theories. It has NOTHING to do with politics thank the Lord, we need no more of that today. I welcome any book suggestions! Have you read anything great lately? Water from my Heart by Charles Martin was excellent. Salt to the Sea by Ruta Sepetys and Everyone Brave is Forgiven are both about WWII subjects I hadn't really heard/read about (and I've read a lot of WWII!). And if you haven't read any books by Fredrik Backman (start with A Man Named Ove) you really should! I read a "Man named Ove" and I LOVED it!!! Great suggestion!!!! I just read all of Ruta Sepetys books including Salt to the Sea. They were all great! They really stick with you. On the lighter side--A Year with No Sugar, a bookified blog about a family (!) that went off added sugar for a year. Good to get me back on the ball in my own kitchen. On the heavy side--did you ever read A Severe Mercy? Rather old but very thought provoking. Thank you as ever for your suggestions! There are two biographies by Marguerite Hamilton that I recently read...."Red Shoes for Nancy" and "Borrowed Angel". These books were published back in the 50's and are no longer in print, but I was able to get them by putting in a request at my local library. I have four granddaughters ranging in age from 9 - 13 and I am going to put these books on their list of books to read. It is best to read "Red Shoes for Nancy" first... "Borrowed Angel" is a continuation of Marguerite's story. If these books were available for purchase, I would definitely buy, as they are keepers. Always enjoy your book posts. Have you read The Sound of Gravel, it's similar to those you described. Hard to read but so eye opening. The Sound of Gravel - a must read in this category! Completely agree. Also, of course, The Glass Castle. I thought of this one too but the fanatic religious theme was so hard to fathom! The dysfunction reminded me of The Glass Castle. Have you read The Summer Before the War, or Major Pettigrew Saves the Day? They are comfort reads so might be a nice counterpoint to your latest reads. I really want to read aloud The War that Saved My Life with my youngest - need to get that going. If you haven't read "a hope more powerful than the sea" (about a refugee) and "the boys in the boat", I highly recommend them! I have a really hard time reading books about neglect and abuse, but we adopted our four children through foster care and through training and other experiences we have heard first hand from birthparents who have battled drugs (some who won and have stayed sober and some not), children that have experienced abuse and neglect, and other foster and adoptive parents and the stories are often difficult to hear but there is also so much hope and courage and strength and real-ness to them. And I have learned more from listening and talking with these people and as a foster mom than anything else. So I loved what you said about human experiences and it truly is about individuals. My best most recent book is Buffalo For The Broken Heart by Dan O'Brien. He's a beautifully poetic writer, in real life he goes from raising cattle to raising buffalo on his South Dakota ranch. I was shocked at how much I enjoyed this book, it's not anything that I would read usually. I think I will read it again, starting right now. I loved An Invisible Thread. I really admire your Uncle John and that is coming from an MSU alumna. How he handled the whole weekend after the plane crash was remarkable and showed what a leader of young men he is. Life is bigger than basketball and he showed that on a big stage. If you haven't read A Man Called Ove - I highly recommend it. I just loved it. I'm reading The Girl With Seven Names - A North Korean Defector's Story by Hyeunseu Lee with David John. I wanted to learn more about a country that I knew very little about. It's hard to grasp that this type of dictatorship still happens in modern day. I have recently read several books by Catherine Marshall. My two favorites are A Man Called Peter (a biography of her husband who was Chaplain of the US Senate and a man of tremendous faith who died in his 40s) and a novel called Christy (a young woman in early 20th century goes to the backwoods of the Appalachian Mountains to teach school and deals with the poverty, crude living conditions, and backwards superstitions yet learns to love the children and learns to find joy in her circumstances). I read the top one. How these kids survived is beyond me. I really really wish I would have kept a journal of all the books I have read. I am reading Dr. Meg Meekers books. Really good! I can recommend goodreads.com. It is GREAT for keeping track of what you've read, and what you'd like to read. "North of Normal" is right in line with what you've been reading: unbelievable childhood turned success story. Also, I highly recommend ANYTHING by Cathy Glass, a foster care mom overseas who writes about various children she has fostered over the years, including her own daughter she adopted through foster care. I think I have her complete collection! I so appreciate your book recommendations--loved the Dan Rather books. I'm going to check these out, too. Thanks! I just finished a binge read of "Nella Last's War," "Nella Last's Peace," and "Nella Last in the 1950s." All are diaries of a real British housewife who recorded volumes in her daily diaries for the British government's Mass Observation Project. Her views of the war and humanity, her ponderings, piques, and her lovely way of expressing the beauty of nature all engaged me. And she was a bit of a quiet, bookworm homebody, which I related to. You might enjoy them, too! "The Hiding Place" by Corrie Ten Boom is one of my all-time favorites. True story of survival (WWII). "When Breath Becomes Air" by Paul Kalanithi was written by a neurosurgeon suffering from cancer. I could not put this book down. It is incredibly thought-provoking and reads like poetry in places. Another favorite is "Destiny of the Republic" by Candice Millard. I was surprised at how engaged I was in this book. The Memory of Light by Francisco X. Stork was amazing. I couldn't put it down. "It's been a long, cold winter, and I am eager for warm weather. I'm tired of seeing bare trees and lifeless brown leaves covering the ground. I long to see wildflowers poke through the dead leaves and to watch the woods turn green once more. Yet even as I anticipate my favorite season, I hear my mother's voice saying, "
the quote is incomplete and the mother's advice is missing :-( how that? Try again Raluca-sorry Blogger must have cut the comment off somehow? It sounds interesting! "It's been a long, cold winter, and I am eager for warm weather. I'm tired of seeing bare trees and lifeless brown leaves covering the ground. I long to see wildflowers poke through the dead leaves and to watch the woods turn green once more. Yet even as I anticipate my favorite season, I hear my mother's voice saying, 'Don't wish your life away.'" I just listened (on audible) to A Man Called Ove. Although fiction it reminded me that everyone has a story and our behavior all has meaning. So Good! 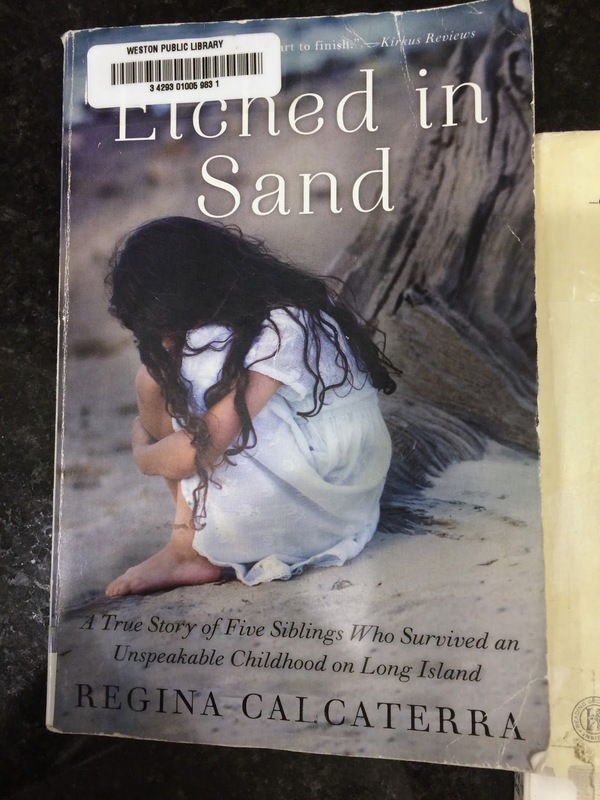 I am currently reading Etched in Sand. I can't put it down! Did you know there is a sequel called Girl Unbroken? It's by Regina and the youngest sister Rosie. I have it on hold at the library. I can't wait! My older brother is an addict. He was once a tall, handsome, young man of promise. Now his body is bent and worn and he lives in a camper with a stray dog. It is the most heartbreaking story. And you are so right...he has 3 children who are just as broken. I loved Mother Theresa's quote. Wrote it down.